Recently I got a catalog from Fire Mountain Gems, my favorite source for beads. I always love them because they spark my imagination. This one, for September, has over 125 pages of seed beads and other small beads that are perfect for needlework. Past columns have given you lots of information about beads, including manufacturers and some shapes and more shapes and finishes. I got excited about this catalog because there are some new shapes in the world of seed beads that have great promise for needlepointers. I’m most excited about donuts. 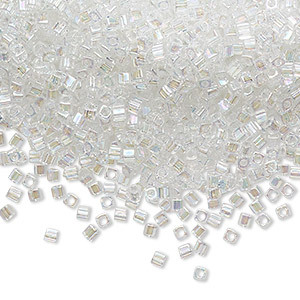 These beads are often called “spacers” in the bead world. They are more flat than seed beads, but still round. Miyuki makes them in two sizes and 25 mostly metallic and colored metallic shades. If you have been looking for something subtle for attaching sequins, these would be perfect. Another new shape is tiny cube beads, also from Miyuki. They come in nine colors, including two transparent and two semi-transparent. These give you flat sides in a size that will nestle well on 18 canvas. The regular size of seed beads is a bit too large and can bunch up. Tila beads are flat square beads with pairs of holes (read my review here). Now available are half tilas. They still have two holes but are skinny rectangles with the holes on the longer side. They come in almost 70 colors in lots of different finishes. One way you could use these is to make a beaded brick wall, but they could be added as embellishments so many ways. 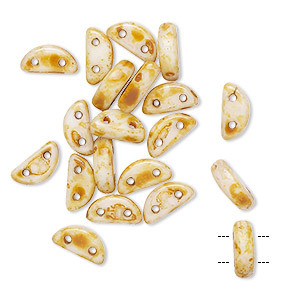 In addition there are also quarter tila beads, creating even thinner rectangles. They come in almost 30 colors in three finishes. 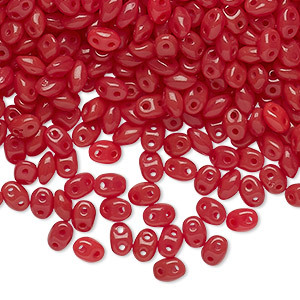 Twin beads are a shape by Preciosa from the Czech Republic that has two holes, like tilas, but is oval in shape. They are not flat but look like a football from the side. They come in two sizes.The mini comes in 20 colors. 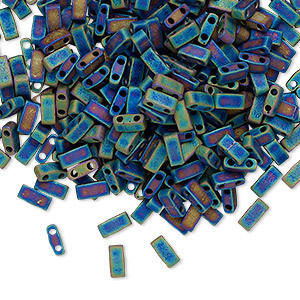 The full-size bead comes in over 100 colors in several finishes. 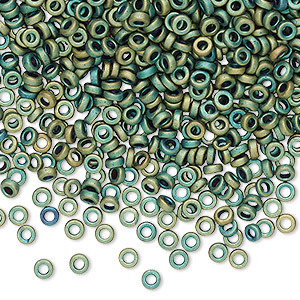 Because several colors come in more than one finish, using these beads could be a great way to add texture to beaded areas. 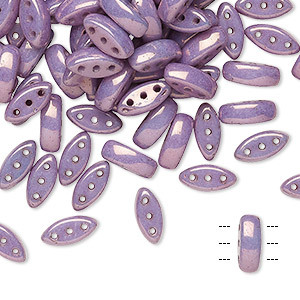 If you want something flat and oval, Preciosa makes a spacer bead called “Cali.” They are oval, flat on both sides, and have three holes. They have pointed, not rounded, ends and come in more than 20 colors. Another two-holed Czech bead, half moon beads are a semi-circle. They are flat on both sides and have the holes along the flat edge. They come in 14 colors, including the unusual rustic color pictured above. I like two-hole beads because they are very easy to attach. You just sew them on with matching thread, just they way you sew on a button. 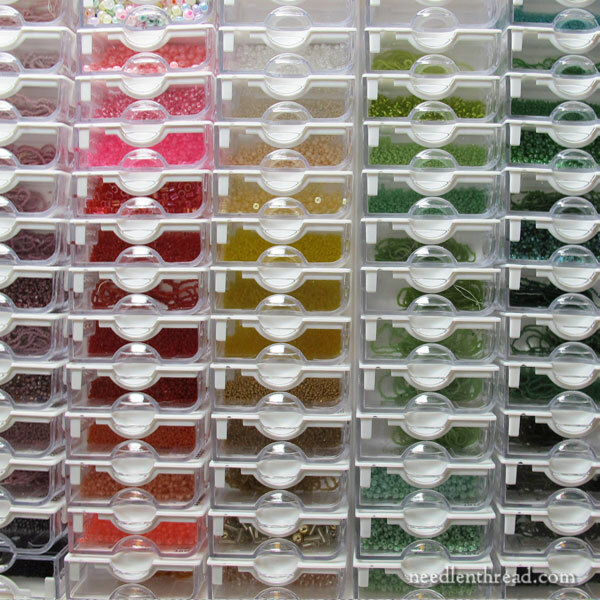 Between all the shapes, finishes, and colors, you’ll be able to find a great bead for any project.